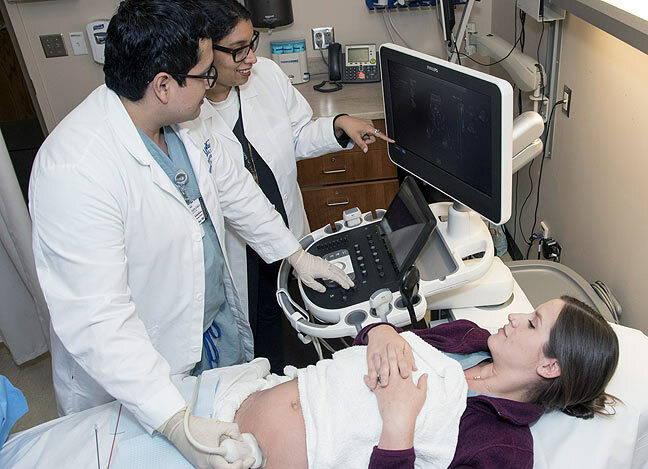 The Department of Obstetrics and Gynecology at the University of Missouri-Kansas City (UMKC) School of Medicine has an ACGME accredited three year Maternal-Fetal MedicineFellowship training program. The mission of the Program is to educate and train Obstetricians and Gynecologists to become highly proficient maternal fetal medicine clinician-scientists, well prepared to provide high quality clinical care and also to pursue scholarly activities. The program is based within the UMKC School of Medicine’s Department of Obstetrics and Gynecology and involves the primary affiliates, Truman Medical Center – Hospital Hill (TMC) and St. Luke’s Hospital (SLH), and also involves the Children’s Mercy Hospital (CMH). We strive to provide a nurturing and intellectually stimulating learning environment with defined expectations. The fellowship is designed to develop clinician-scientists who are prepared to conduct research, teach, and provide high quality subspecialty care. In the course of training, time is dedicated for research, coursework, ultrasound interpretation, genetic counseling, pathology, neonatology, OB anesthesia, and applicable clinical involvement. The clinical training involves two tertiary perinatal centers in the principal teaching hospitals and provides extensive experience in managing high risk pregnancies including advanced perinatal interventions. The research opportunities include translational molecular, developmental pharmacogenomics, advanced ultrasound imaging, and clinical investigations. Conferences, graduate courses, and tutorial sessions round out the training to allow the fellow to achieve Board certification in Maternal-Fetal Medicine. The fellows also have an opportunity to obtain a master in science (MS) degree in Bioinformatics through the University. Each fellow is expected to conduct independent hypothesis-based research under a mentor’s supervision to fit ABOG’s thesis requirements. A first author, hypothesis-based, written research manuscript is required prior to graduation. This thesis must be defended to thesis committee in preparation for MFM oral board exam. The fellow is expected to have a permanent Missouri License, DEA, and BNDD prior to starting fellowship. Hospital and university credentialing, GME orientation, and all required training must be completed prior to the start of clinical rotations (July 1). Human research training (e.g. CITI) is required. The fellowship is designed to meet all educational objectives specified in the Guide to Learning in Maternal-Fetal Medicine (American Board of Obstetrics and Gynecology, posted at http://www.abog.org/pdf/GuideToLearning-MFM.pdf and dated 2007) and to prepare fellows to meet the requirements for maternal-fetal medicine subspecialty certification.